Use the AutoFormat As You Type feature to quickly apply or change automatic formatting for things such as hyphens and dashes, fractions, hyperlinks, quotation marks, and bulleted or numbered lists. To enable automatic formatting for a program, select each option you want to turn on. To turn off automatic formatting, clear each option you want to turn off. After you have configured your AutoFormat As You Type preferences, click OK.
What's the difference between "AutoFormat" and "AutoFormat As You Type"? AutoFormat As You Type settings are applied to text while you are typing. The settings on the AutoFormat tab are applied when you manually run the AutoFormat command (which requires using the Quick Access Toolbar). Most of this article describes options on the AutoFormat As You Type tab. 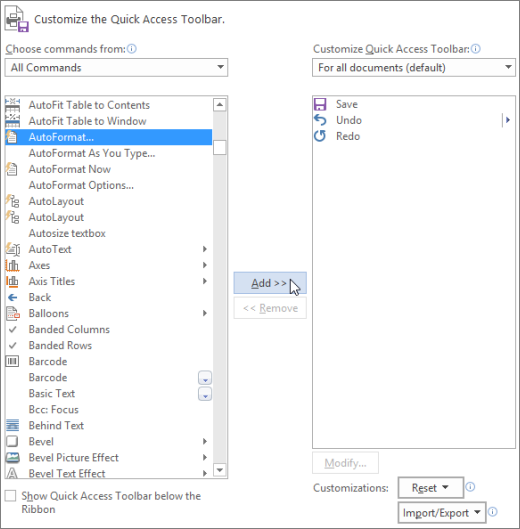 See Using the AutoFormat tab and the AutoFormat command in Wor﻿d below for information about the AutoFormat tab. 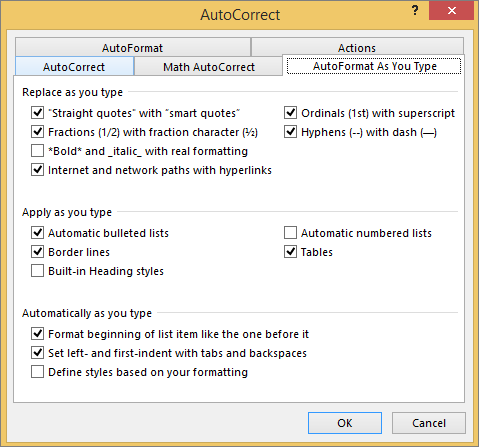 To make changes to automatic formatting behavior in an Office program, first open the AutoCorrect Options window, then select the AutoFormat As You Type tab. Click File > Options > Proofing > AutoCorrect Options. Click the AutoFormat As You Type tab. Click File > Options > Mail > Editor Options > Proofing > AutoCorrect Options. 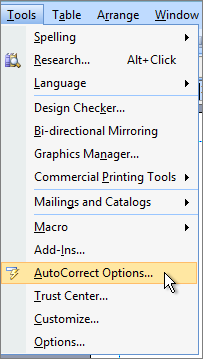 Click the Microsoft Office Button > [Program] Options > Proofing > AutoCorrect Options. Open a mail item, and then click the Microsoft Office Button > Editor Options > Proofing > AutoCorrect Options. On the Tools menu, click AutoCorrect Options. What does each option mean? The set of AutoFormat As You Type options you see may vary a bit depending upon which program you're in. Some apps, like Visio, will only have a small number of these options. Replaces straight quotation marks (" ") and straight apostrophes (' ') with curved, open and closed, quotation marks and apostrophes. Replaces common typed fractions (such as 1/2) with single-character equivalents (½). This option works for the following typed fractions: 1/4, 1/2, and 3/4. To insert single-character equivalents of a few other fractions (such as 1/5) see Insert a check mark or other symbol. Applies bold font to any text enclosed in asterisks (*) and italic font to any text enclosed in underscores (_). For example, *computer* becomes computer and _computer_ becomes computer. Note that in Word the (*) or the (_) will be replaced by the formatting. In Outlook the (*) and (_) will remain even after the formatting is applied. Replaces typed Internet addresses, network paths, and email addresses with hyperlinks. Replaces ordinal numbers (which show the relative position of an item in a sequence) such as 1st, 2nd, or 3rd with superscripted versions (such as ). Replaces a double hyphen (--) with an em dash (—) and a space-hyphen-space sequence ( - ) with an en dash (–). Note that if you want an em dash do not use any spaces before and after the double hyphen. Replaces typed smiley faces and arrows with equivalent character symbols and emoticons. Creates a bulleted list when a line of text starts with *, -, or > followed by a space or tab. To end a bulleted list, press ENTER two times. Draws a line when you type three consecutive ~, #, *, -, _, or = characters ﻿on a new line and then press ENTER. For example, typing ~~~ on a new line and then pressing ENTER draws a wavy line across the page. Applies heading styles to paragraphs of five or fewer words (that do not end with punctuation) after you press ENTER two times. For Heading 1, type a new line without any preceding tabs. For Heading 2, precede the new line with a single tab. For Heading 3, precede the new line with two tabs. Note: You must press ENTER two times after the previous paragraph to automatically apply heading styles. Creates a numbered list when a line of text starts with the number 1 followed by a period or tab. To end a numbered list, press ENTER two times. Creates a single-row table when you insert a sequence of plus signs (+) and hyphens (-) at the start of a line of text and then press ENTER. You must begin and end the sequence with a plus sign. For example, +---+---+------+ creates a single row table with three columns. The column width is proportional to the number of hyphens between the plus signs. To add rows anywhere in the table, position the cursor at the end of the row where you want to insert the new row, and then press ENTER. Adds a new row or column to an existing table when you enter data in an adjacent row or column. For example, if you have a two-column table in columns A and B, and then enter data in an adjacent cell in column C, column C is automatically formatted as part of the existing table. Decreases the font size of the title text so the text fits in the defined title text placeholder. Note: The title text automatically decreases by only one font size increment (for example, from 44 to 40) based on the built-in font sizes for the font. If you want to further decrease the font size, select the title text and either choose a smaller built-in font size from the Font Size list or type the font size you want in the Font Size list. Decreases the font size of the body text so the text fits in the defined body text placeholder. Formats the lead-in text of a list item like the lead-in text of the previous list item. Lead-in formatting is repeated up to the first punctuation character of the list item, typically a period, colon, hyphen, em dash, question mark, exclamation point, or similar character. Only formatting that applies to all of the lead-in text is repeated in the next list item. Formatting that applies to only a section of the lead-in text is not repeated in the lead-in text of subsequent list items. Indent the first line of a paragraph by putting the cursor before the first line and pressing the TAB key. Indent the whole paragraph by putting the cursor before any line in the paragraph (except the first line) and pressing the TAB key. To remove an indent, put the cursor before the first line of the paragraph and press the BACKSPACE key. Applies a built-in style to manually formatted text when the text has the same formatting as a built-in style. Applies a single formula to all table cells in a column. The formula automatically adjusts to extend to all table cells in the column. Click the headings below for more information. Tip: You can also use CTRL+Z (Undo) to immediately undo a formatting change for this instance only. Change this specific AutoFormat option globally by clicking the Stop option so that Office stops making the automatic change it just did. Change AutoFormat options by clicking Control AutoFormat Options to open the AutoFormat As You Type tab and change settings. Word has an AutoFormat tab in addition to the AutoFormat As You Type tab. The AutoFormat As You Type settings are applied to text at the time you are typing, as described above. The AutoFormat tab is less commonly used, because the options on it are only applied when you run the AutoFormat command, which you must add to the Quick Access Toolbar to use. The AutoFormat command makes the same kinds of changes as those made by AutoFormat As You Type settings, but the formatting is applied to text that has already been typed. For example, you can use AutoFormat to replace straight quotes with smart quotes, or replace fractions with fraction characters, in an entire document at once. 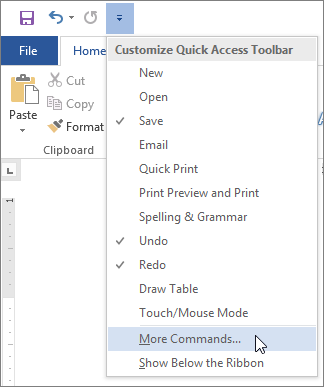 In Word, click the Customize Quick Access Toolbar icon, and then click More Commands. Under Choose commands from, select All Commands. Scroll down in the list, select AutoFormat... or AutoFormat Now, click Add, then click OK.
To run the command, click the AutoFormat icon in the Quick Access Toolbar. To use the AutoCorrect feature to correct typos, capitalization errors, and misspelled words, and automatically insert symbols text, see Choose AutoCorrect options for capitalization, spelling, and symbols. To format a date in Excel, see Format a date the way you want. To work with the Auto Fill feature in Excel, see Fill data automatically in worksheet cells. To manually configure paragraph indents in Word, see Create a first line indent. To automatically insert blocks of text using AutoText and the AutoText gallery in Word, see Automatically insert text.